Photograph published in Le Miroir 8 December 1918. Here, Alsatians and Lorrains mobilised in the German army during the war have returned, dressed in their German uniforms. The French soldier, shown from the back, has removed his epaulettes to clearly proclaim that they are no longer part of the German army. 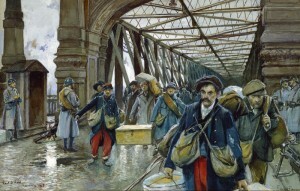 © Pari, musée de l’Armée. 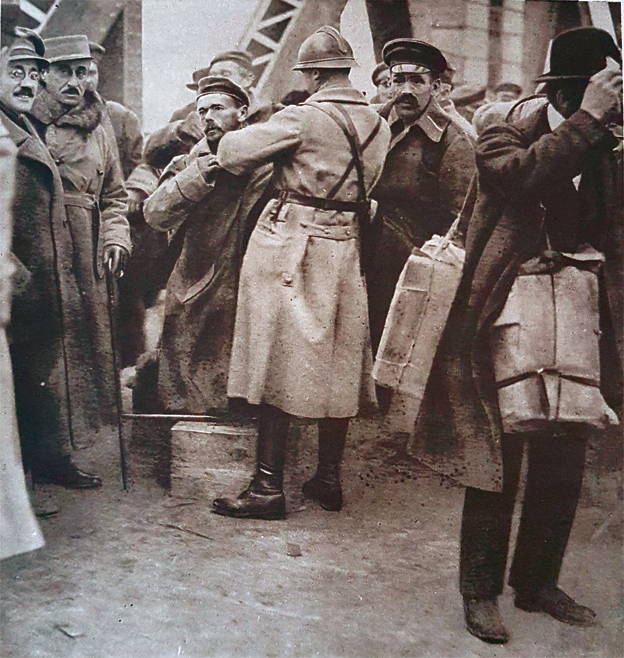 With the announcement of each armistice, an important change in situation began for many people: civilian refugees, for example, having fled their territory occupied by their adversary and/or devastated by war, had to choose, if possible, to return or remain where they had found refuge. The fate of prisoners of war was directly tied to the signed convention, but also to military, political, economic, etc. constraints. Their return is generally made in several stages. Whether returning by their own means or following a special procedure, due to their military status, they had to first go to the military authorities of their own country. For France, from 30 November 1918, it was General Dupont who organised the repatriation of more than 500,000 French prisoners held in Germany. In the camps where all nationalities were present, the situation was explosive. The operation ended in mid-January 1919. First, prisoners of war were grouped together to undergo medical examinations. They were then directed to a barrack where were required to complete a questionnaire, including in particular, questions about the origin of their captivity. 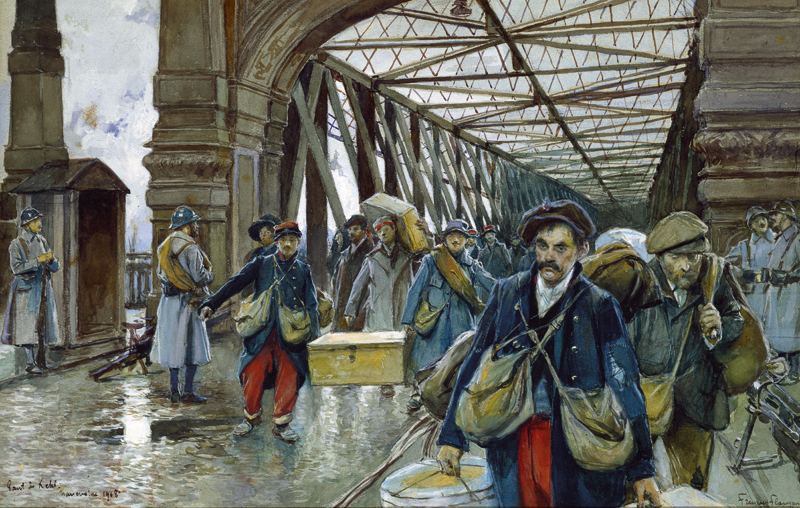 Depending on their nationality and military status – a distinction was made between career soldiers and mobilised soldiers – they went on leave to see their families, for about a month, in the case of the French. The latter were generally automatically reassigned to the Depot of their weapon in the recruitment district to which they belonged until they were demobilised. 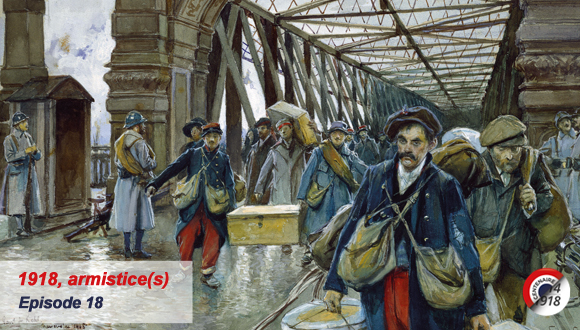 The British and Americans prisoners, fewer in number, were relatively quickly repatriated. The same could not be said of the Russians, for instance, held in Germany as workers after the signing of the Brest-Litovsk armistice, sometimes until 1922. Due to political developments in the country, the prisoners’ return was not always desired by the Russian authorities. The return of prisoners to civilian life was a new struggle for men who generally traumatised by the experience of captivity, often suspected of having taken shelter away from the war, having made a deal with the enemy… Society in general put them aside by treating them differently from other former combatants. The case of German prisoners held in France until the beginning of 1920 is the subject of intense German and French propaganda which resulted in isolation for France vis-à-vis its international partners. France held around 400,000 German soldiers hostage, as a guarantee, until the signing of the Treaty of Versailles (1919), then pending payment of compensation and the dispatch of workers. They were used as cheap labour to rebuild areas devastated by the war and carry out thankless and dangerous tasks. These prisoners would harbour a deep resentment against France.